Барааны дугаар 9780195307610. Categories: Dictionaries, OXFORD. The publication of this fully updated edition of A Dictionary of Genetics coincides with the hundredth anniversary of the introduction of the term genetics by William Bateson in 1906 at the Third International Conference on Genetics. Since then genetics has made tremendous advances in knowledge and technique and now occupies a pivotal position in the life sciences as the most powerful means for probing fundamental questions in cell biology, development, and evolution. The determination of sequences of complete genomes, the study of gene expression and genetic variation on a global scale, and the ability to rapidly amplify gene sequences and to achieve targeted gene disruptions are just some examples of major achievements in this field. Proliferation of new terms inevitably accompanies such remarkable progress. This new edition of theDictionary addresses the needs of students, educators, and clinical geneticists for an authoritative and up-to-date reference work that not only defines the latest terms, but in most cases, also presents important ancillary encyclopedic information. 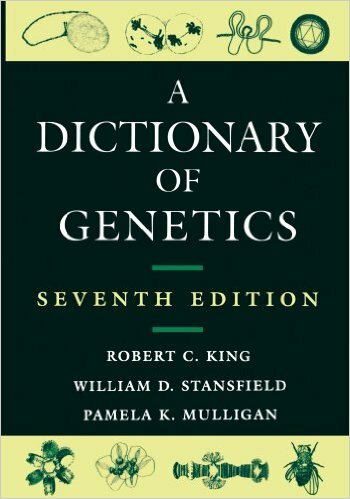 A Dictionary of Genetics is unique in that it includes terms from a wide range of disciplines which now intertwine with genetics, including molecular biology, cell biology, medicine, botany, and evolutionary studies. Its 7,000 cross-referenced definitions are supported by an excellent collection of line drawings, tables, and chemical formulae. One-fifth of the Dictionary is devoted to six appendices to which the definitions are cross-referenced and which contain an extraordinary trove of supplementary information. This includes a chronology of important advances spanning the years 1590 to 2005, lists of useful internet sites and periodicals, a classification of living organisms into an evolutionary hierarchy, and a sample table of genome sizes and gene numbers. These features make A Dictionary of Genetics a lexicon unparalleled in the field.